Published November 2017. This has been reprinted due to popular demand. 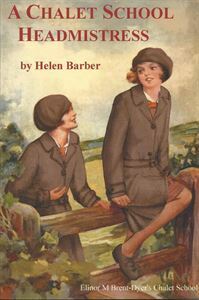 A Chalet School Headmistress is set during the same term as The Mystery at the Chalet School and was first published by GGBP in 2004. We are delighted to be republishing it now. ‘Bill’ has now been officially promoted as Miss Annersley’s Co-Head, and is determined to show herself worthy of the honour. Naughty Middles, a disruptive Junior and a spiteful Senior all combine to test her leadership skills. ‘Bill’ demonstrates that she shares to the full her colleague’s well-known ability with girls of all ages. But her responsibilities are not confined to the girls under her care, and when she is confronted with a mistress’s personal tragedy, ‘Bill’ faces her greatest challenge. Helen Barber has written a brand new short story especially for this new edition, A Storm in a Teacup. A Chalet School Headmistress will be published at the end of November.